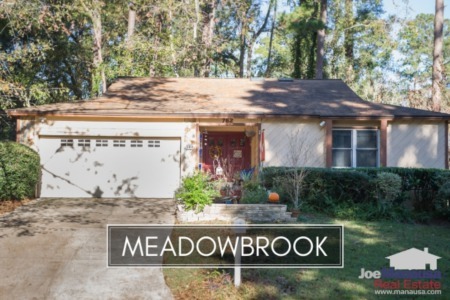 Meadowbrook is a very popular neighborhood on Tallahassee's east side, and it attracts people who like to be close-in to the Tallahassee downtown area. The last time I wrote a home sales report for Meadowbrook, I stated that the super-low home prices would not last long. If you happen to drive near the intersection of Mahan and Capital Circle on the east side of Tallahassee, pull into Meadowbrook so that you can see a very bizarre turn of events. After starting the year with a record first-quarter, nothing is for sale (except one home seller who has priced themselves out of the market). It is important to note that the narrative contained below is for sales through December for all previous years, but through August in 2015. 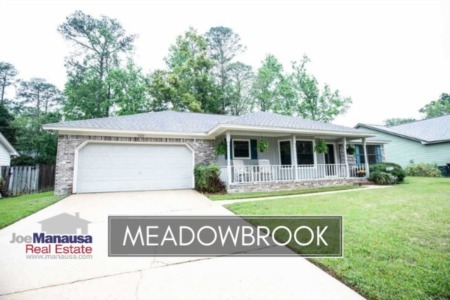 The graphs and the closed sales table will be continuously updated into the future (meaning bookmark this page if you always want to know the current status of homes in Meadowbrook). Average home prices in Meadowbrook this year are below $150,000, but there is one available now for $275,000. The average recorded sales price is $142,400 in 2015. Nine homes sold and closed in the first quarter of 2015, yet not one has sold since. Considering that there are 282 homes in the Meadowbrook neighborhood, we would expect to see closer to 14 sell each year. I would think that won't happen this year. Average home values in Meadowbrook are lower now than at any time going back to 2002. One might mistakenly believe that many of these sales have been distressed situations (short sales, foreclosures, bank owned properties), but this is not the case. Eight of the nine homes sold in 2015 were "arms length" home sales. In 2015, the average value of a home sold in Meadowbrook was been $90 per square foot, and that is a value that certainly cannot be matched by a home builder. I think this is why homes that hit the market over the past 18 months sold so quickly, home buyers knew value when they saw it. I think just about everything that hits the market in Meadowbrook that is priced correctly will sell fast, so the home size average merely reflects the inventory offered recently. Thus far in 2015, the average size of the 9 homes purchased has been 1,578 square feet. I hope you enjoyed our September 2015 update on home sales in Meadowbrook, please feel free to drop me a note if you have questions not covered in this report.